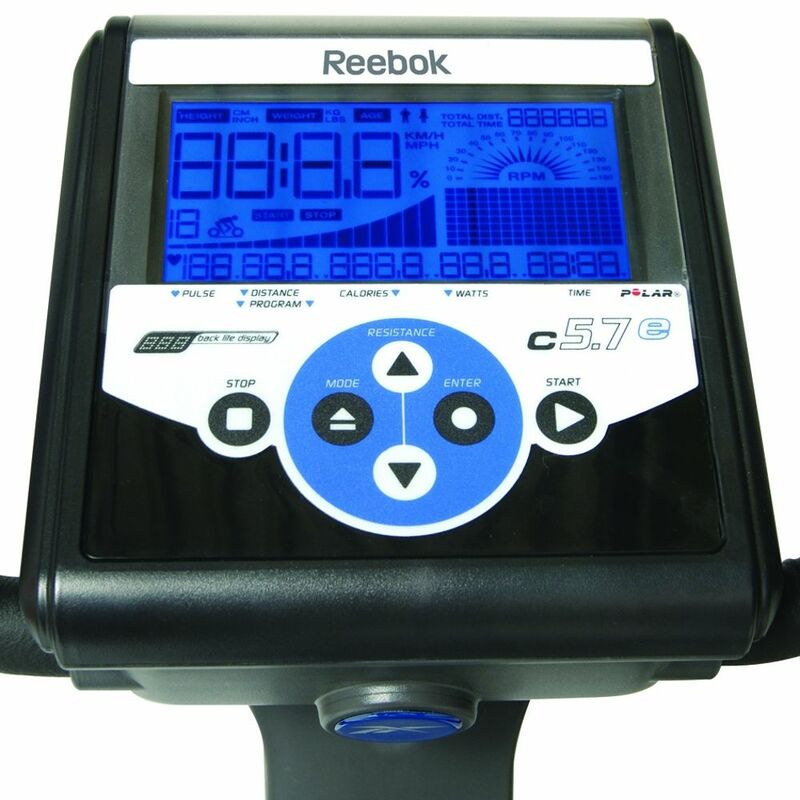 The very latest offering from brand leader Reebok Fitness, the C5.7e Cross Trainer is crammed full of features: 16" stride length, 10kg flywheel orchestrated by 12 programmes. Solid and sturdy with excellent build quality, this model is the successor to the popular C5.5e and therefore the new top of the range cross trainer / ergometer of the Performance Series. 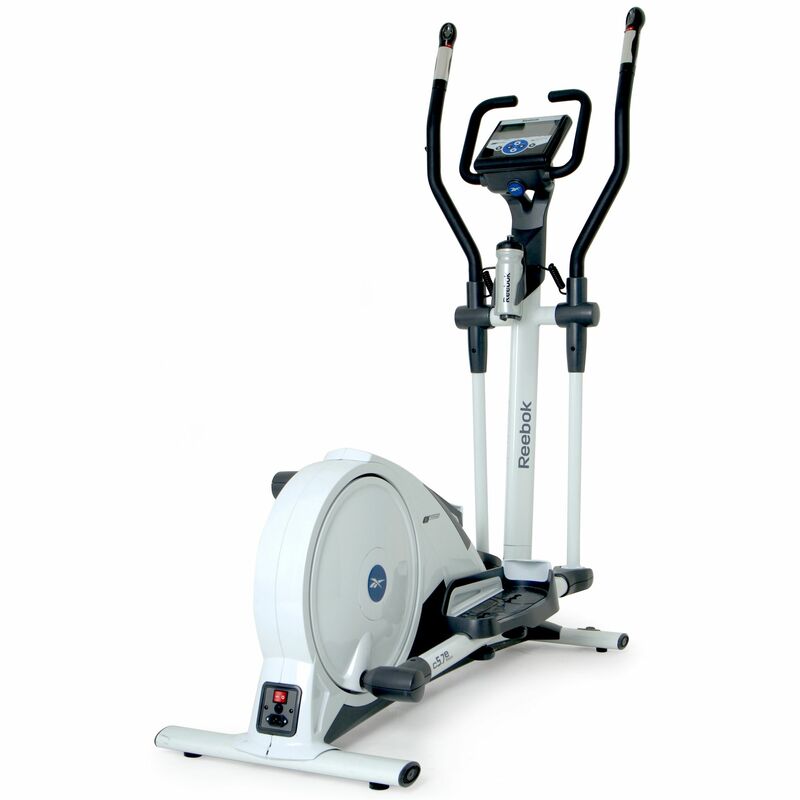 The 25 - 400 Watt performance control works separately from rpm, and the 5 individually set training programmes allow for tremendously effective full body training. As a result, the C5.7e is equally suited to increasing performance and serving in therapy. New control units and pulse sensors in the arm levers make the choice of training features convenient and effective. Workout Console: Allows you to store individual exercise data of up to 9 user profiles. In addition, the computer displays clearly arranged exercise data such as level of resistance, speed, time, distance, calories and heart rate. The Backlight ensures optimum clarity of the display even in badly lit areas. Programmes: Totaling 12 scalable professionally designed preset programmes, these include 9 individual target programs, 2 heart rate programs, and 5 programs that can individually be determined and saved support your training targets. Stride Length: 40cm / 16” for a long and smooth action. M-Force EMS Direct Drive System: This electromagnetic break system is controlled by the computer and provides optimal precision data. The resistance levels are adjusted in 5 watt steps between 25 and 400watts to ensure you find the perfect level to suit your needs. The electromagnetic resistance changes instantly on the machine, and ensures the most consistent resistance is provided to give ultimate consistency in performance. Belt transmission: The Poly-V special belt transmission assures silent exercises and optimal power transmission to the exercise. 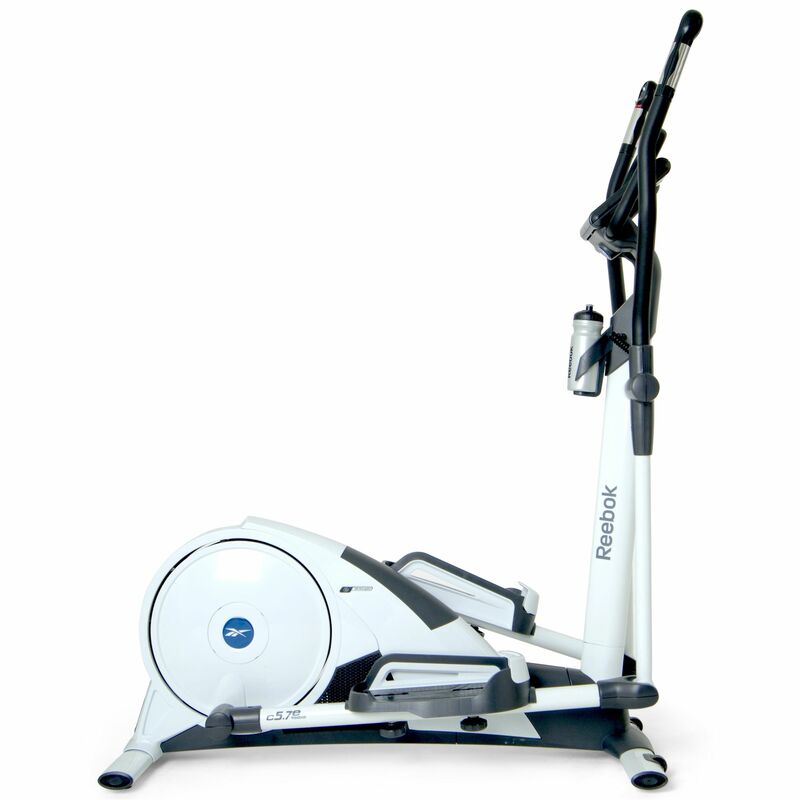 Stable frame structure: The Reebok C5.7e Elliptical Cross Trainer is built using special tubing and construction to ensure the highest level of stability and safety for the user from the first use. Quality ball bearing swivel joint: All swivel joints are double ball bearing and therefore provide best operating characteristics. Multi-position performance handle bar: Continuous adjustment for different body positions during the exercise. 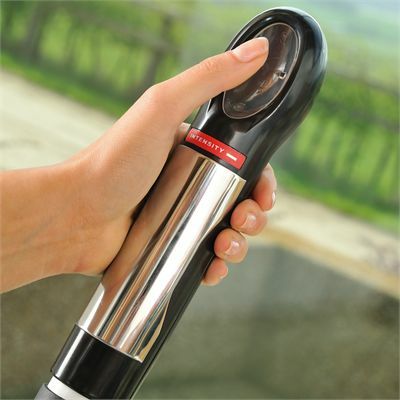 In addition, the handle bar can infinitely be adjusted in down tilt. Motivational arm levers: Performance control and pulse meter in the arm levers mean you can adjust and control your workout without cessation of exercise, and keep constant track of your heart rate all the while. Smart Pulse hand pulse sensors: Ergonomically positioned hand pulse sensors are perfect for quick measurement of your training heart rate. Attached in front of the console, they are optimally positioned for ease of use, and display the reading directly on to the console. Wireless receiver: The integrated polar receiver allows you to train with the integrated wireless chest transmitter (included), and to receive accurate and consistent ECG precise heart rate data shown directly on the display. Adjustable pedals: pedals can be adjusted both forwards and backwards, therefore enabling you to find the optimal position for each individual user. Floor level adjustment: This elliptical cross trainer has independent leg-levelers to ensure the machine is flat on the floor and sturdy in use at all times. Transport wheel: Integrated in to the frame for easy transportation when the machine is not in use. Warranty: Manufacturers’ on site 2 years parts and labour cover for any issues, and ultimate user confidence. for submitting product review about Reebok C5.7e - Cross Trainer.